Want yet another reason to cast your vote? How about all of the Election Day Freebies being offered by the various restaurants and Fast Food Chains. And we just love free! Many of our ancestors (men and women) fought for the right to vote and we shouldn't take that right for granted. If you don't think that your vote counts, you're wrong! In 2000 only 537 votes in the State of Florida were the determining factor between the Bush and Gore Presidential race. Why do some establishments give away free stuff simply because you voted? Firstly, they want to encourage people to vote. Secondly, many are hoping that if you come in for the freebie, that you'll also purchase other food items to go along with the freebie. And let's face it, if you're hungry, many of us do. It's smart marketing. Not only do they get more customers that may not have come into their establishment that day, but they also get additional media and print coverage. Think of how many news articles, websites and blogs (including this one) are mentioning and listing these Restaurants for free, because they're giving away something for free. We all win. 11/6 - Order Online and Save 20% - Use coupon code: VOTE at checkout. 11/5 to 11/9 - Place your online order and enter promo code "VOTED" to receive $5 off your take-out order of $30 or more. 11/6 – Wear an “I Voted” Sticker or say “Vote” to the Cashier, and you’ll receive a free taco. 11/6 - Show your "I Voted" Sticker and get a Free Bagel and Shmear. 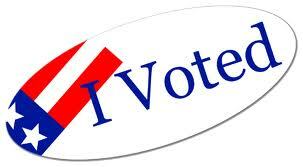 11/6 - Wear your "I Voted" sticker or pin and receive a Free Small Drink with the purchase of any adult entree. 11/6 - Show your "I Voted" Sticker and receive 20% off Food and Souvenirs. Not valid on alcoholic beverages. Dine-in only. 11/6 - Mention an email you received for a Free Dolcini w/any adult entree and receive a Free Dolcini (up to $3.95 value). 11/6 - After 2:30pm Grilled or Blackened Tilapia Tacos will be $1.50 each. No coupon required. 11/6 - Get a Free Indivisible Bracelet. 11/6 - Show your "I Voted" Sticker and receive a Free Donut with your beverage purchase. 11/6 – Wear your “I Voted” sticker and get a small Sweet Potato Fry w/any purchase. If you don't want to wear your "I Voted" Sticker, an easy way to keep it on you is to stick it on your Cell Phone. Then show the sticker to the Cashier. Offers valid at participating locations. It's important that you call ahead to make certain that your Restaurant is particpating in the promotion and to verify the time(s), prior to visiting it. Many Restaurants are owned and operated by individual Franchise owners, and they may/may not be participating.